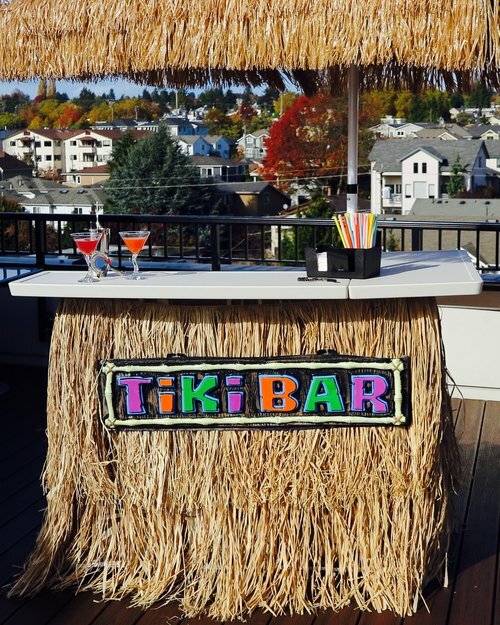 Tiki Event Beverage Service Package — Seattle Bartending Co. Beverages will be provided at a flat per-person charge rate based on the final confirmed guest count, finalized 10-days prior to the event date. Package rates do not include hourly service rate, tax, gratuity, or service charge. These events require a 12' x 12' x 12' working/setup space. QUANTITIES PROVIDED: QUANTITIES PROVIDED: We average 1 drink per hour for the three hours of event service (standard package duration). We provide an even split across the types of beverages offered (beer and mixed drinks) for our quantities. Should your group have a preference for a certain type of drink over the others, please let us know in advance. ie. if you know your group will drink more beer than mixed drinks, we can provide higher quantities of beer and less on the mixed drinks. Reduction in the amount of Varietals of Signature Cocktails or Beer offered does not reduce the package price, as overall consumption remains the same. Standard events hold a maximum of 5-6 hours of alcohol service time, depending on event timeline for meal service (ie. Weddings, Corporate Dinners, Birthday Celebrations, etc). All Hosted events require estimated consumption billed in advance of event. Requests for cocktails not listed above may result in an increase in the package price.